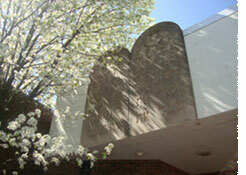 Our philosophy reflects a commitment to Torah study, spiritual growth and the State of Israel. The congregation embraces new members and visitors with warmth and friendship. Prayer services are traditional; Halacha, Jewish Law, is strictly observed and the synagogue houses the community mikvah. Congregation Etz Chayim a member of the Orthodox Union, is accepting of a broad range of observance within a Halachic common denominator.